Despite environmental concerns, AT&T is pushing its plans to install 726 refrigerator-size, sound-emitting utility boxes on city sidewalks. The massive installation will proceed unless the Board of Supervisors votes to require an environmental impact report (EIR), scheduled for Tuesday, May 24. A noon press conference with community speakers will be followed by citizen lobbying to the offices of individual Supervisors. Everyone is encouraged to join this event and communicate with his or her Supervisor. AT&T secured a blanket go-ahead for its massive "U-verse" installation, when the Planning Department granted a "categorical exemption" from an EIR.This exemption allows AT&T to disregard environmental impacts caused by the giant utility boxes that will litter our sidewalks. SFB and Planning Association for the Richmond (PAR) challenged that determination and filed an appeal with the Board of Supervisors. The number of community groups supporting the appeal for an EIR is growing, but so too is AT&T's considerable lobbying pressures upon the Board of Supervisors. Normally required of any large scale project, an EIR would produce an objective and transparent analysis to measure the cumulative impact upon our neighborhoods. It would address the current AT&T plan, plus existing and anticipated additions to our streetscapes. Following protocols of the California Environmental Quality Act (CEQA), an EIR should ensure efforts are made to mitigate or eliminate environmental impacts. An EIR should buttress enforcement of existing regulations that prevent the needless privatization of our public sidewalks. The Board of Supervisors first heard the appeal last month. During five hours of testimony, AT&T told the full Board of Supervisors reasons it was either unable or unwilling to comply with City regulations that require their boxes to be primarily placed underground or private property. One Supervisor found it "hard to believe" that AT&T cannot maintain U-verse equipment on private property even though AT&T maintains infrastructure for its wireless network on private property. The Department of Public Works (DPW) relies almost entirely on information provided by AT&T rather than conducting its own review of alternatives to placing the boxes on our sidewalks. There are no metrics for determining the cumulative effect. The Planning Department stood by its claim that AT&T's proposed 726 utility boxes pose no cumulative effect to our environment, yet City departments cannot quantify the various structures already populating our sidewalks. Though the current AT&T plans are virtually the same as those submitted then withdrawn three years ago, U-verse boxes are as huge today as they were then. AT&T is attempting to sidestep the more costly alternatives required under regulations signed by Mayor Ed Lee in 2005, when he was Director of the Department of Public Works. Those regulations state that, if not placed underground, utility boxes are to be placed on private property. This private-sector solution requires genuine, thorough efforts to contract property owners who are willing to lease space for Internet and cable equipment. These existing regulations state that street-level fixtures are a last resort only if the other two approaches prove technologically or economically infeasible. In writing the 2005 regulations (and after extensive collaboration with San Francisco Beautiful, AT&T and others), Lee determined "...surface-mounted facilities in the public right-of-way will impede travel on public streets, inconvenience property owners, create visual blight, or otherwise incommode the use of the public rights-of-way by the public." As a matter of City policy, utility boxes are blight. The same DPW order acknowledges the quick evolution of technology, requiring the City to conduct annual meetings to review the latest equipment and best practices that would mitigate utility box blight. The City has not held the required meetings in five years. An EIR would go far to make up for lost time and to help pierce the prevailing information vacuum. At the Supervisor's hearing, at least two potential undergrounding alternatives were mentioned and have since been outlined in a Bay Guardian article that tempers some of the U-verse marketing claims. 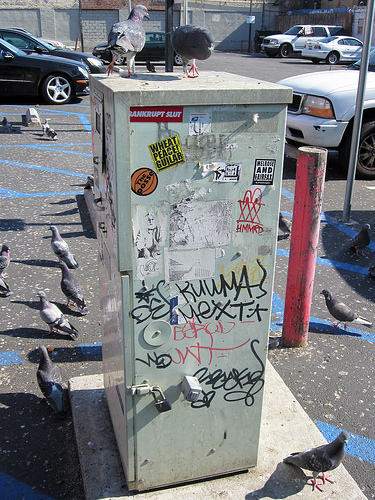 AT&T's 726 proposed utility boxes are four-feet high, four-feet wide, and over two feet deep. They would be flanked by vertical posts to prevent damage by vehicles. They emit a steady noise, the sound of, says AT&T, an electric toothbrush.Already intrusive, the utility boxes will be permanent graffiti magnets, obstacles to the visually impaired, and hazards to opening passenger car doors. Property values are jeopardized since a utility box certainly detracts from the "curb appeal" of one's house or commercial property. Contrary to its ad slogan, AT&T seemingly refuses to "rethink possible." 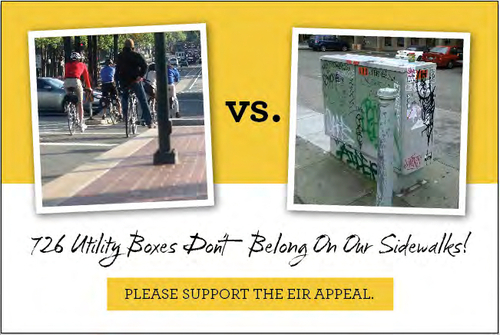 An EIR would force the opposite, and identify current, practical and equitable means to vastly reduce utility box blight. At the same time the City's high-tech infrastructure would expand - all in environmentally responsible ways that are possible today. If there is to be progress, an EIR is a must.But your Supervisor must hear from you before next Tuesday's vote. San Francisco Beautiful is a 501(c)(3) non-profit membership organization that works to assure that the city retains and enhances its unique and memorable sense of place, balance and diversity as a beautiful, livable, green and vibrant urban center. "Boxed Out: Fiber-optic proponents think outside AT&T's network upgrades"
BeyondChron: "Environmental Review Needed on Massive AT&T Utility Box Project"